As the sting of an early winter continues taking cold bites out of the Sussex coast, May seems a lot more distant than six months ago. It was a gloriously sunny early summer bank holiday weekend and we were in a People’s Palace atop a North London hill; a palace that had given birth to UK roller skating in 1875 and the BBC in 1936. The inaugural UK Roller Derby Association Southern tournament had brought together five top derby leagues. Central City Rollergirls, whose Birmingham base somewhat muddied the definition of ‘Southern’, had come in as late replacements for Wycombe’s Big Bucks High Rollers. Brighton had originally been second seeds in the tournament, but the replacement saw Central City – then ranked slightly higher than the Sussex league – bump them down to third. This presented the Rockers with a trickier, one bout longer path to the final, including an early meeting with the near invincible winners-in-waiting London Brawl Saints. The one match-up almost everyone in the derby hall was looking forward to most was that between Brighton and CCR. Scheduled as the semi-final, should things go as per the rankings, this meeting of the two most closely matched sides in the tournament was sure to be a humdinger. Except it never took place. 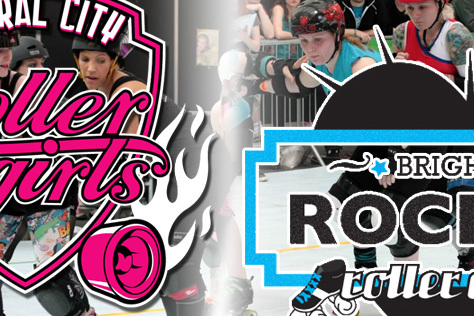 For any number of reasons, such as the patchwork nature of an injury-blighted Brighton squad and the highly charged performance of Bristol Harbour Harlots (playing above ranking expectations in every bout), the Rockers and Central City never did meet that weekend. Facebook and Twitter buzz between the two teams in the following days lamented this and suggested a match-up should be arranged for another time. That time is now. Well, Saturday 23rd November to be exact. Doors at 2.30pm, first whistle at 3pm. The location is the Dolphin Leisure Centre in Haywards Heath, now destined to be the Rockers’ only bouting venue with the other, the Roller Central warehouse in Shoreham-by-Sea, due to close at the end of the year. (Given that the Rockers train several evenings a week at Roller Central too, they are on the look out for a new training venue urgently – get in touch with them if you have any ideas.) The bout, entitled Terror-Track-Thrills (equal parts applause and pained looks to whoever came up with that one) has a Jurassic Park theme, and attendees are encouraged to come dressed as their favourite dinosaur. The Dolphin is just five minutes walk from Haywards Heath station (turn left and follow the roller derby signs taped to lampposts, walls and small dogs) and the pub opposite the station – the Burrell Arms – is pretty OK for a footbally station pub should you arrive early. There are two bars at the leisure centre itself, a cafe-style one also offering food in the lobby and a small secret one a few corridor turns past the sports hall. The Dolphin contains the usual leisure centre features, such as vending machines, overly hot hand dryers in the toilets and loads of sickeningly healthy-looking people wandering around in tracksuits. The after party takes place in the Rockers’ new official home pub, the Cornerstone, located on the corner of Brighton’s Elm Grove, Islingword Road and Lewes Road. The night will also see the launch of the league’s own ale, Off Your Rocker from the Downlands Brewery, featuring a suitably skater bedecked pump clip. Those who have another important event long pencilled in for the 23rd should bear in mind that the bout will be finished well before 5pm and the after party will only really get going later in the evening, so yes, you do have time to go home and watch the 50th anniversary Doctor Who in-between (er, if you live locally that is, probably not so much if you live in the Midlands). Tickets for the bout are priced at £10 (free for under-12s) and available from the link below. Having suffered a few unexpected losses since May, CCR are now placed below the Rockers in the rankings. The official UKRDA table shows the Brummies in 14th place and Brighton 8th, with both teams having recently been nudged down one by Cardiff’s strong Tiger Bay Brawlers finally playing enough UK leagues to be rankings eligible. We tend to place more credence on the alternative Europe-wide table at flattrackstats.com instead, and that suggests this bout will be a nailbiter. They rank Brighton 25th and CCR 27th, and their online prediction calculator gives the Rockers a 64% chance of taking the win (compared to CCR’s 36%) and expects Brighton to score 50 points for every 43 Central rack up. That differential would equate to a result in the region of 140-120, which is insanely close in derby terms. For a more detailed bout preview, including the thoughts of players from Leeds, Auld Reekie and London Brawl Saints, pick up a free copy of our fanzine Turn Left at the bout. The mag also contains interviews with six Rockers skaters, alongside seven players from other leagues, the world’s most ill-advised roller derby training guide and more. See you there! This entry was tagged Brighton Rockers, Central City, Haywards Heath, roller derby, roller skating, sport, UKRDA, women's sport.